Before going any further I have a confession to make, I am not the world’s biggest tower defence fan. I find the genre a little too passive, sitting back and waiting for enemies to come to me is not my bag. I’m the type of chap who will run head first into Call of Duty: Black Ops 2 action, only to have to respawn every 15 seconds. Thankfully, CastleStorm is not a passive tower defence game as it puts as much importance on attack, as it does defence. Playing CastleStorm sometimes feels like juggling a grapefruit, a beanbag and a cat. You start off in campaign mode and over a series of levels you are introduced to the various gameplay styles included in the game. At its core, it is tower defence. You must protect your castle and/or flag from waves of encroaching enemies. They attack you along a single path, and it is up to you to slow them down or stop them as best as you can. However, there is more than one way to skin these particular Vikings. 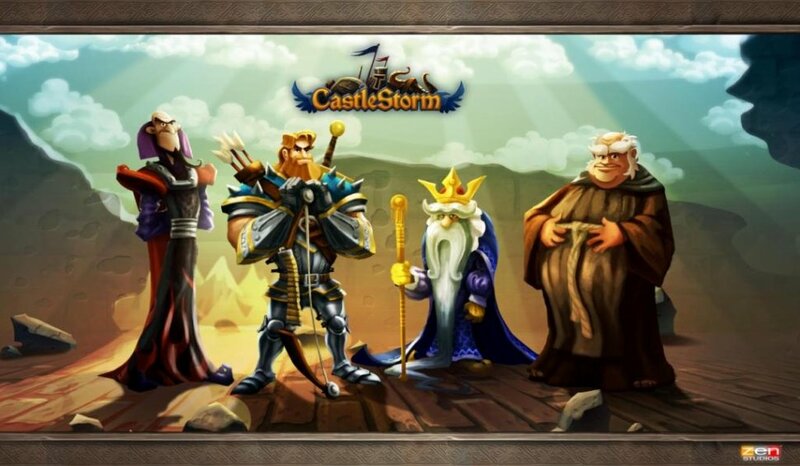 Whilst the likes of Plants vs. Zombies have you passively setting up towers and letting them do the work, CastleStorm expects you to get your hands dirty and is far more interactive. The ballista is your main weapon, a tower mounted cannon that you can use different types of ammo with to kill the enemy or attack their base. Using the joystick you must aim and fire different projectiles. At this point the physics feel somewhat like Zen Studios own Zen Pinball 2 and that is no bad thing – as they know their Newton’s balls. As well as firing directly on the enemy, you can also send out different types of troops who cost varying amount of food. How many troops you can have on the field and their effectiveness is determined by upgrading your castle over time – a bigger larder means more food, therefore more troops can be bought. Heroes are also important; they can be dropped in at critical moments to take out the enemy from behind. Finally, magic will heal troops, or slice ‘n’ dice the enemy. All these various game elements are controlled by the face buttons and cycling through with the LB and RB. As the levels progress the gameplay can get quite fraught as you jump from firing off a sheep, to sending out a donkey rider, to magic, a sheep again, a hero, a archer etc. etc. The secret is that Zen Studios balances the different elements well. It does take a while to get your head around the various actions you can undertake, but I for one enjoyed the proactive feel the gameplay brought to the tower defence genre. This is a Tower Attack game, not defence. The campaign introduces the various gameplay elements at a steady pace bringing with it a series of nice surprises, but also a challenge. You may have noticed that I have yet to talk about the co-op elements of CastleStorm and this is for a reason. To unlock the meat and potatoes of the 2 player co-op, you will need to have played the story campaign as far as you can. The various heroes, projectiles and levels are only revealed in co-op after you have unlocked them in solo play. This smacks to me of the co-op in CastleStorm not being a core premise when Zen developed the game; co-op is a side dish to the main solo meal.